HGTV Dream Home 2019 Sweepstakes – Win the 2019 Dream Home & more! Win the 2019 HGTV Dream Home, a Honda Pilot Elite and $250,000! ENTRY LIMIT – Limit one entry per site/person per day. ELIGIBILITY – This Sweepstakes is open only to legal residents of the U.S. and its territories, possessions and commonwealths who are 21 years of age or older as of December 27, 2018. SWEEPSTAKES ENTRY PERIOD – Beginning at 9:00 a.m. Eastern Time (“ET”) on December 28, 2018 until 5:00 p.m. ET on February 18, 2019. 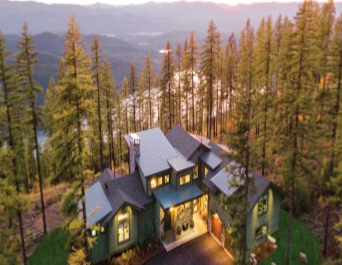 PRIZES – Grand Prize: One (1) Grand Prize Winner shall win the following prize (the “Grand Prize”), which consists of: (i) the home located in Whitefish, Montana (the “HGTV Dream Home 2019”) that is featured in the “HGTV Dream Home 2019” special (including home furnishings, fixtures, artwork, and merchandise contained therein) (approximate retail value (“ARV”): $2,047,855); (ii) Two Hundred and Fifty Thousand Dollars ($250,000) (awarded in the form of electronic funds transfer), courtesy of Quicken Loans Inc. (the “Cash Prize”); (iii) a 2019 4WD Honda Pilot Elite automobile (ARV: $48,020) (the “Honda Prize”). Actual value of HGTV Dream Home 2019 depends on market fluctuations. All components (as applicable) of the HGTV Dream Home 2019 will be selected by Sponsor at its sole discretion. The HGTV Dream Home 2019 shall be conveyed to the Grand Prize Winner without representations or warranties, express or implied, other than those, if any, provided by the contractor. In lieu of taking title to the HGTV Dream Home 2019 (and the contents of the HGTV Dream Home 2019), the Grand Prize Winner will have the option of receiving Seven Hundred and Fifty Thousand Dollars ($750,000) in cash (the “Cash Option”). If Grand Prize Winner elects to take the Cash Option, the Grand Prize Winner will still receive the Cash Prize and the Honda Prize. If the Grand Prize Winner cannot take possession of the HGTV Dream Home 2019 due to a force majeure event, failure of construction, or any other reason as determined by Sponsor in its sole discretion, Grand Prize Winner shall receive the Cash Option (in lieu of the HGTV Dream Home 2019), Cash Prize and Honda Prize. Sponsor and/or American Honda Motor Co., Inc. reserve the right to replace the Honda Prize with a cash prize in the event (a) the Grand Prize Winner is not a citizen of the U.S.; or (b) the Grand Prize Winner does not reside in the 48 contiguous states. Total ARV of Grand Prize is $2,345,875 if Grand Prize Winner takes title to the HGTV Dream Home 2019 or $1,048,020 if Grand Prize Winner selects the Cash Option in lieu. WINNER’S LIST – Winner’s List: Beginning on or about April 17, 2019, you may obtain the name of the Grand Prize Winner by going to the HGTV Website (http://www.hgtv.com/). Hi Richard – The only information I have about the dream home is the link to the sweepstakes. I’m not affiliated with HGTV. My best advice as to where you can find the answers to your questions, is to explore the Dream Home site after you enter the sweepstakes. HGTV has lots of information about the Dream Home on their site.